PanARMENIAN.Net - Libya's oil guard brigades, which control Ras Lanuf and Es Sider, two major export terminals closed since 2014, are working with the unity government's state oil company, NOC, and preparing to reopen fields to pump crude again, a spokesman said on Thursday, July 7, according to Reuters. The spokesman for Ibrahim Jathran's PFG forces did not give any details whether that would include reopening the two ports soon. Starting shipments there would restore a potential 600,000 barrels per day of crude export capacity. Militant attacks, fighting between rival factions and a conflict between two rival governments have kept Libya's oil production at around 350,000 bpd, or less than a quarter of its output before the 2011 uprising that ousted longtime strongman Muammar Gaddafi and began years of instability. "The commander of Petroleum Facilities Guards (PFG), Ibrahim Jathran, has announced that oil will be pumped soon and oilfields of the oil crescent (region) will be also prepared to resume work," PFG spokesman Ali Hassi said. "Jathran said that we, the PFG of central region, will work with the NOC that belongs to the presidential council of the government of national accord." In a Reuters Oil Forum on Thursday, analysts said the NOC unification would be beneficial, but oil recovery in Libya could be undermined by the fragility of Prime Minister Fayaz Seraj's government, long-term technical damage and the array of armed groups controlling oil fields, sometimes over local grievances. 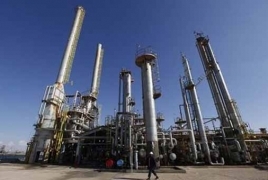 The NOC announced this week that it would merge with an energy company set up in the east by Libya's eastern government, a move seen by analysts as a step towards restoring order to the industry at least in legal and commercial terms. The NOC in Tripoli, recognized by the international community, and the eastern NOC had operated in parallel as the rival governments struggled for control. The U.N.-backed government now in Tripoli is meant to supersede those administrations, but hardliners on both sides are holding out. The NOC has an ambitious plan to bring Libya's oil production back to pre-revolution levels. But damage to oil pipelines left closed for months, and to ports that have seen fighting, may take years to fully repair.